Do male and female supervisors appraise employees differently? Do short bursts of exercise help a person retain memory 24 hours later? Can hospitals save money by choosing tap water over sterile saline solution to cleanse wounds without endangering the patient? And what about tax exemptions for municipal bonds? Can a policy revision raise badly needed revenues for the federal government? How would this affect investors and municipalities? Samford University student researchers tackled these questions---and many more---in projects reported on during a series of scholarly poster displays and oral presentations April 30-May 3. About 130 students revealed results of research projects in a variety of disciplines, representing many hours of preparation and implementation. That so many students engage in research is a testament to their commitment and to that of the faculty, who spend many hours beyond class and office time helping students perfect each project and presentation. "Because of the commitment of our faculty to student learning, students are able to engage in primary research-in the lab, field or survey environment-and then develop and practice the tools to analyze their findings," explained Samford assistant provost Dr. Nancy C. Biggio, who coordinates the annual Samford Student Showcase. "For those students who are considering graduate study, this opportunity will be invaluable and will uniquely prepare them." 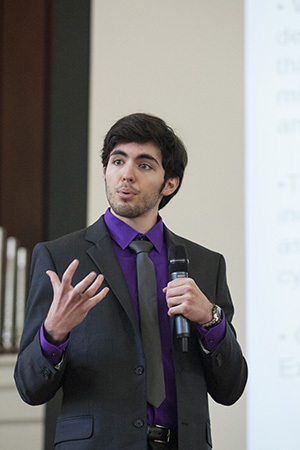 Four projects were chosen for "Samford Spotlight" presentations in Reid Chapel on May 2. "Samford Spotlight is designed to highlight the wide array of undergraduate research at Samford," said Biggio. The presenters were nominated by their department chairs and deans for noteworthy research they have performed in their courses, frequently as part of a senior capstone experience. The unique challenge for students presenting at Spotlight, said Biggio, is the need to translate their research and knowledge to a broad audience of non-experts. "Developing this skill alone is highly valuable to both participants and attendees." "It's hard to explain a bond in 15 minutes," said business major Lauren Bates as she introduced her project, "Implications of Tax Provision and Subsidy on Municipal Bond Yields" to the Spotlight audience. "In the face of a mounting national debt, the tax exemption for municipal bonds has been identified as a policy that could be revised to raise revenues," said Bates, a Brock Scholar whose study addressed a key policy implication and its impact on federal tax revenue, budget deficits, municipal finance and tax-exempt bond investors. Psychology major Brooke Elkins told how her study on "Women and Men in the Workplace: Appraised Differently? By Whom?" revealed that women in a supervisor position may tend to evaluate employees more equally than do male supervisors. "Males tend to believe that male employees were both more deserving of a salary increase and that their reliability was more important in determining an annual increase than for female employees," said Elkins, who also found that for supervisors who were high in religious fundamentalism, helping co-workers was much more important in determining salary increases in female employees than in male employees. Sports medicine majors Bobby Ellison and Kolin Rubel set out to find a link between anaerobic exercise and the retention of working memory over a 24-hour time period. While much research has been done to measure the effect of aerobic exercise on memory, little exists on anaerobic, or short bursts of energy such as sprints. Using control and exercise groups, in which all subjects were asked to recall information read to them, Ellison and Rubel found a significant difference in the retention of phrases between the two groups. Their conclusion: Anaerobic exercise increased the capacity of the brain to store data and improve recall. Ida V. Moffett School of Nursing students Ali Edwards, Trinity Henderson and Meredith McCoy examined existing studies of wound care practices to determine the safest and most cost efficient methods. In an international study across four countries and another at Stanford University Medical Center in California, tap water was favored over normal saline in preventing infection. However, other research revealed no significant or insufficient evidence to support or undermine the use of tap water. The Samford student nurses suggest the research would benefit from a pilot study involving a specialized wound care nurse. And, in an effort to reduce overall hospital costs and be most efficient with time management, hospitals should consider using tap water as their standard irrigation for wound cleansing. Overall, the poster and oral presentations represented a fascinating look at studies in biology and environmental sciences, business, classics, family studies, geography, journalism and mass communication, kinesiology and nutritional sciences, mathematics and computer science, physics, psychology, religion, and world languages and cultures. Robert Barnett combined expertise from his computer science major and geography minor to map Birmingham's homeless population as it relates to food access. The project shed light on the geospatial relationship between homelessness and food deserts, so that city planners and shelters can improve access to food services in the future, said Barnett. One fact he uncovered is that only 19 percent of homeless shelters are within a five-minute walking distance of a grocery store. "I didn't know much about the homeless before, but these people have gone through difficult circumstances," said Barnett, who completed the research last fall. In December, he presented his work to representatives from One Roof Alabama homeless referral agency. Another poster presenter traveled a bit farther to share his findings prior to the on-campus presentations. Business major and Brock Scholar Cameron Collins studied the impact various factors, such as the allocation of funds, have on public education graduation rates in the U.S. Earlier in April, he had presented his findings at a meeting of the Association of Private Enterprise Education in Hawaii.